For people who like to smell wood blossoms in the cool fresh mountain air while plunging in gently flowing cool blue waters, or go caving (spelunking) this summer, Blue Water Cave is one perfect place to go. Quezon town mayor Gregorio Gue said the local government and Kiokong Climbing Society—a non-profit group—developed the Kiokong Eco-Tourism project to oversee town visitors’ activities while trekking and spelunking especially during weekends. “Visitors should clean their own mess and keep back the trash with them to preserve the cleanliness of the place,” he said. 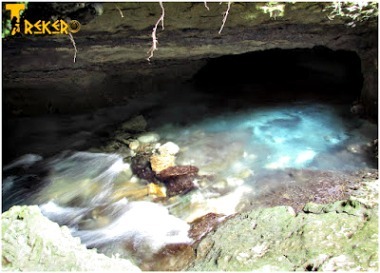 A natural tourist attraction hidden in the country view of San Jose village in Quezon, Bukidnon, Blue Water Cave River flows underground in connecting caverns, which is blue in color all year round. The trail to the blue waters includes a scenic view of white rock cliff walls, where hikers and rock wall climbers pulled themselves up a steep rock face surrounded with amazing rock formations, rolling hills and mountains. Take hikes, take photos, breath the fresh air deeply, and notice the amazing animals from flying lemurs to species of birds soaring up high. The entrance is along the national highway with a huge billboard describing at a glance what this municipality offers. Quezon Municipality is said to be Mindanao’s sugar capital located in southern Bukidnon. It is four to five hours away from Cagayan de Oro and three to four hours from Davao City. Visitors can get in touch with Kiokong Eco Tourism days before the actual visit for food and transportation tips. A narrow trail leading the Blue Water Cave is clearly visible and no guide is required to reach it. It is an easy way towards the paradise, until a steep way downwards approaches to finally reach the riverbank of Pulangi River and see the wonderful cave. The cool, semi-deep, pure blue water meets the Pulangi waters, and leaves a bluish area before mixing with waters of the giant Pulangi River. The cave’s opening is small. At the bottom, cool and clear water accumulated. It is freezing cold and very refreshing. Following the trail back is also the route for the White Rock Wall Climbing. There are fixed pitons (mountaineering device) going up the White Rock Wall. These are like pegs hammered into rocks with hooks where the mountaineer attaches karabiners. Karabiners are metal loops used as connectors to safely hold a freely running rope. The Kiokong Climbing Society facilitators always check the safety gears. They demonstrate how to pull ropes up and how to rappel down. They said a “beginner” usually goes for up to 30 feet but for advanced climbers, facilitators can offer the 30-meter climb. This hidden paradise of Southern Bukidnon is truly an amazing tourist destination one could unexpectedly thought of Bukidnon to have this place as one of its treasures. The adrenaline rush adventure of its trail, the amazing rock formations, cool, pure, and clear water gushing from a cave makes this beautiful Blue Water Cave perfect for a summer get away. Its unspoiled beauty, serene surroundings, and wildlife treasures have enticed countless visitors each year.